The 2013 Man of Steel movie featuring Henry Cavill as the last son of Krypton was an instant hit. But does the latest slot van Playtech live up to the expectations? It is packed with special features and progressive jackpots, but the graphics aren’t something to write home about. When Playtech acquired the DC license from Microgaming, everybody was shocked. They have not only released slots based on older Superman movies but slots based on newer ones as well, such as 2013’s Man of Steel, starring Henry Cavill as the last son of Krypton. 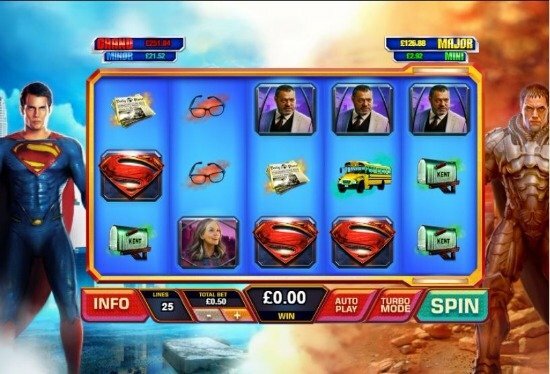 The Man of Steel slot is heavily based on that film, and the characters which appear in the Man of Steel slot machine are right out of the movie. How do those graphics compare, though? We’re afraid our Man of Steel slot review isn’t going to get off to the best start. The Man of Steel video slot features some pretty poor graphics. Whilst the audio and video clips are decent, the graphics are near woeful. It looks as though Playtech were rushing things with their Man of Steel online slot. With Superman, Superman II, Man of Steel, and a host of Wonder Woman and Batman themed slots all launching at the same time, this is pretty apparent. The graphics are dodgy (including a school bus, newspaper, Clark Kent’s glasses, a camera) and some of the movie’s characters. The movie characters don’t look so bad, but they are hardly inspiring. The wagering system in the Man of Steel game is bizarre. Players are going to end up using the simple total bet button to stake anything form 0.50 per spin, up to 2,500.00 per spin, even though there are only 25 paylines on this game’s 5 reels. You are undoubtedly paying extra for the features. The Man of Steel slot RTP rate is 95.05%, which isn’t too bad at all. Of course, there is a Man of Steel jackpot, and there are four of them. These progressives are won randomly via the DC Super Heroes Jackpot Game. 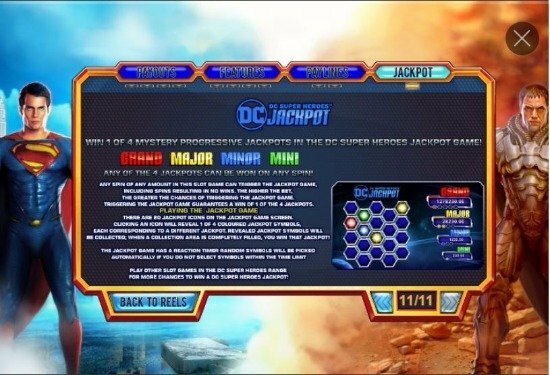 In this feature, players can locate 3 of the same colours behind a hexagonal screen to win either the Grand, Major, Minor, or Mini progressive jackpots which run on the DC Super Heroes Jackpot Network. Those jackpots are shared with other DC superhero-themed slots. Superman appears as a wild symbol in this game, as do general Zod, Faora, Namek, and Jor-El. All 5 of these wilds can substitute for other symbols in the game, barring other special symbols. These surpluses of wilds are easily some of the best Man of Steel slot bonuses players could ask for. Landing Superman and General Zod anywhere on the reel will trigger a Shifting Wild feature, which can see Superman move right, and General Zod move left on each spin. Land them next to each other, and the Battle for Earth free games bonus is triggered. Landing the Krypton Bonus icon on the fifth reel will trigger another Man of Steel free spins bonus. Landing the World Engine Bonus icon on the fifth reels triggers another feature and one which can see a terraforming blast unearth up to 7 wilds onto the reels. 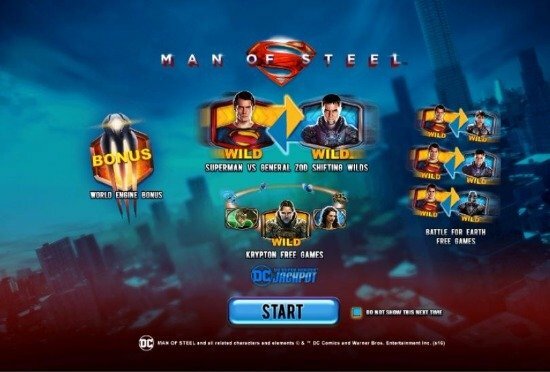 In the first Man of Steel bonus game – the Battle for Earth free games feature – Superman and General Zod can clash on the reels and fight it out, dishing out extra wilds. When Superman is defeated the bonus ends. Until then you can enjoy free spins galore. In the Krypton free games features, players will get to play 50 paylines (instead of the default 25 lines), and the Jor-El wild will lock on the reels for the duration of the bonus. Up to 10 wilds can lock onto the reels at any one time, for a total of 7 spins. Will the Man of Steel slot save the day? The Man of Steel slot machine is jam-packed with special features, four top-notch progressive jackpots, cheapish bets, and a killer, modern Superman theme. The only things this slot lacks are decent graphics. We’re prepared to forgive Playtech for their hasty graphical design, though, since the features and prizes in this slot are out of this world.